This is the full gallery to accompany the original Tony Conrad at Spaceland article. I walked into a Tony Oursler book signing and heard Tony Conrad totally droning out and feedbacking really loudly. No one was paying any attention at all. I came back a little while later and went to the upstairs part of the gallery and took this photo. It sounded really good. Again, no one was paying attention. He was playing with a woman named MV Carbon, who was on cello. Both of them had tiny Marshal amps that were cranked. It was super good. 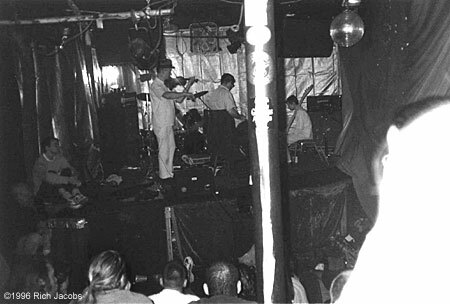 Tony Conrad at Spaceland, 1998. Photo by Rich Jacobs. 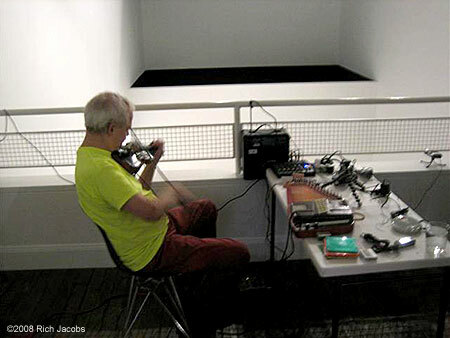 In between a week’s worth of matinee performances at the Los Angeles Museum of Contemporary Art’s Temporary Contemporary, Tony Conrad performed one night at Spaceland. With friend Alexandria Gelencser on bodyless cello, Tony tried to saw his violin in half and swayed around the stage with 35 years worth of cloudy, clear, cloud flotation experience behind him. Slow, slower, slowest. Continuous ebb and flow. Egg on. Loud, louder, loudest. With Alex’s steady drone supplying the foundation, Tony was really free to soar on this night, and that he did, despite the fact that the sound system occasionally cut out, which reduced the volume level somewhat for a few moments at a time. Silhouettes of the pair were thrown by a lamp onto a large, translucent sheet that completely hid the stage. Alex’s silhouette remained motionless, save for her right arm, which steadily sawed away as Tony slowly swirled in time to this timeless comforter of sound. After 45 minutes, Alex finally had to give up when her cello began to cut out really bad, and Tony followed suit a moment later. Thanks must go out to these two troopers for sticking it out as long as they did, and for flowing out some original, important and lively music. 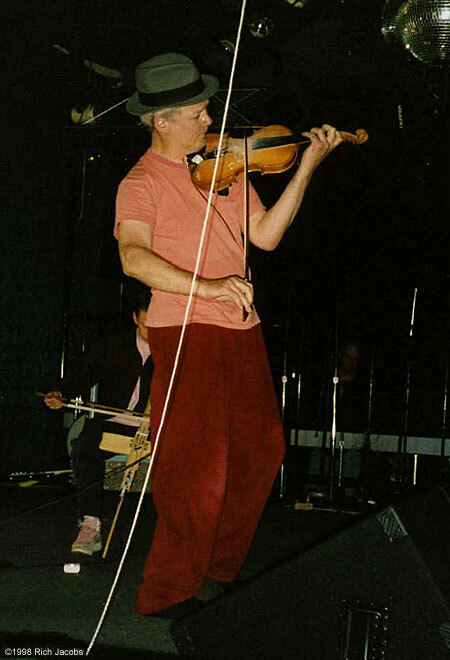 Tony Conrad et all, 1996. Photo by Rich Jacobs. Since the early 1990s, the Atlanta independent label Table of the Elements has been very busy issuing many important minimal, drone, noise, improv and other experimental recordings from the past, present and future. They hosted their second gathering for like-minded individuals at The Empty Bottle, a small club right across the street from an ultra-sketchy area of Chicago. 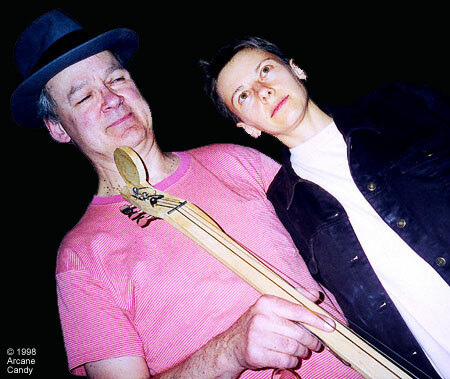 Tony Conrad and Alex Gelencser, 1998. The early bird, I mean minimalist catches, I mean gets the worm, I mean word in edgewise–or actually a lot of words in all over the lengthy liner notes of numerous LPs and CDs. Tony Conrad is one such large, flightless bird. From 1962 to 1965, he played violin in minimalist music founder La Monte Young’s Theatre of Eternal Music group, also known as the Dream Syndicate, which included La Monte and Marian Zazeela on drone vocals, John Cale on viola and Angus MacLise on percussion. Since La Monte’s been keeping the tapes “safe” in storage since the mid ’60s–for the most part denying access and copies to the other group members and the public at large–very few people outside of the original small audiences have ever heard what must have surely been the most searing, transporting drone music of all time. Practicing regularly, the group developed into the most awesome unit of 4:00 a.m. hover power. Perfect pitch, just intonation, long durations and massive amplification of the vocals, viola and percussion to tympanic membrane-cutting levels were some of the ingredients of this galaxy hub-bound stew. 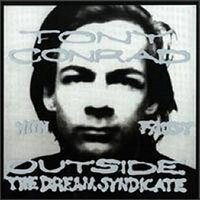 You are currently browsing the archives for the Tony Conrad category.